In the framework of axiomatic information retrieval, the semantic term matching technique proposed by Fang and Zhai in SIGIR 2006 has been shown to be effective in addressing the vocabulary mismatch problem, with experimental evidence provided from newswire collections. This paper reproduces and generalizes these results in Anserini, an open-source IR toolkit built on Lucene. 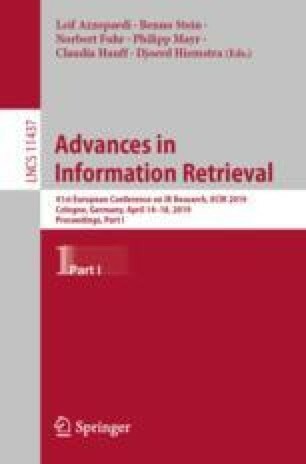 In addition to making an implementation of axiomatic semantic term matching available on a widely-used open-source platform, we describe a series of experiments that help researchers and practitioners better understand its behavior across a number of test collections spanning newswire, web, and microblogs. Results show that axiomatic semantic term matching can be applied on top of different base retrieval models, and that its effectiveness varies across different document genres, each requiring different parameter settings for optimal effectiveness.